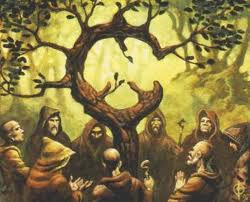 As we write, the moment sacred to all Druids world-wide is an hour and a half away, the "standing still of the sun." The moment at which the sun reaches its zenith at the Tropic of Cancer. Every day after today will be shorter in the Northern Hemisphere for the next six months. Today, the sun will never set at the North Pole. It would be appropriate to bow to an oak this afternoon. Wear a wreath of Leucothoe on your head. Crush some strong-smelling herb in your hands and release the aroma to the wind. Pour oil and wine on a stone.